It is very important to give labels to your cables. Labels make your network troubleshooting less painful. In case of problem, you don't want to trace every cable end to end. Each end of cable should be labeled, the label should give information about where the cable is connected to. It is really up to you or your company policy how the description format of the labels should be written. for the IDF cable: MDF_Core1_23 -> it tells that the cable is going to the MDF Core Switch 1 at port 23.
for the MDF cable: IDF_2Fl_1_1 -> it tells that the cable is going to the IDF at second floor, switch 1 and port1. Well I suggest try designing your own labeling scheme and don't forget to write it down and give the description to fellow network installers and the project owner. You can use many tools for your labeling, there are many tools to make your labeling easier, some tools will keep track on your labels and generate the next label automatically while some tools require us to input the label writing manually. 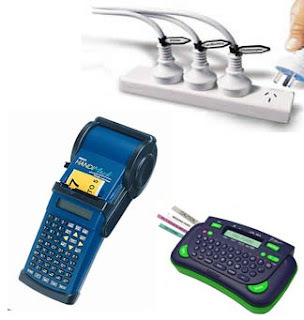 Below is a variety of tools you can use for your labeling purpose, you can find a lot of tools available at my favorite site http://www.cableorganizer.com.